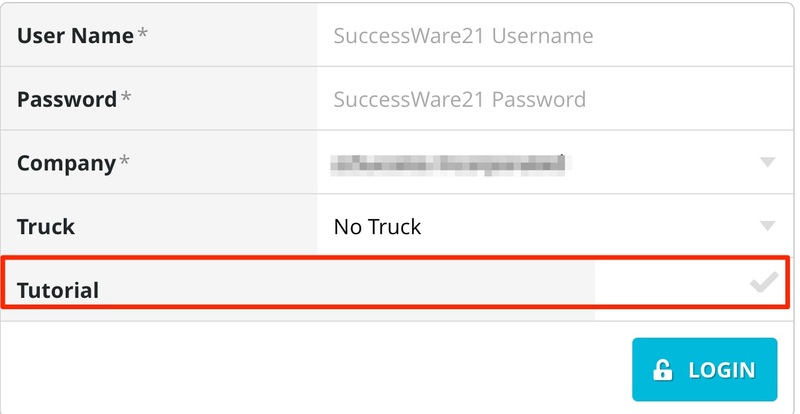 How Do I Set Up The Tutorial Company in SuccessWare21 for Use with SWRemote? • generic database/Pricebook: If you want a generic database/Pricebook you must contact SuccessWare21 support at 888-251-2779 or [email protected] We would be happy to do this for you. For ASP customers: you will need call Synoptek at 877-884-6277 or Advance2000 at 844-744-2421 and request that the live data be copied into tutorial. Please ask for a Ticket #. Please contact us once they have completed copying the Live Database. For LAN clients: contact Tech support at SuccessWare21 at 888-251-2779 or [email protected] They will schedule a time to make a copy of your Live Database and place it into the tutorial database. 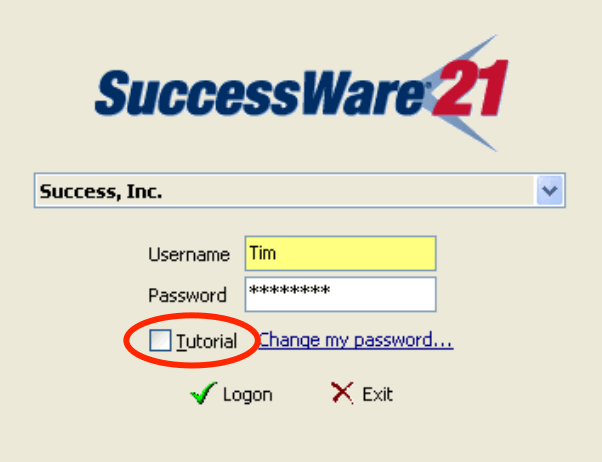 Log into SuccessWare21 as you normally would (Live, not Tutorial) and copy the agent password. To access the Agent Manager*, log in as an administrator, then click the red 21 button -- > Setup --> Utilities --> Administrative Tools --> Agent Manager. Then, copy the agent password from the box to the left of "swmagent." 2.Logout of SuccessWare21, then check the "Tutorial" box and log in. 3. A. Now you need to go into the Agent Manager on the Tutorial side, by following the same path: red 21button -- > Setup --> Utilities --> Administrative Tools --> Agent Manager. B. Now, paste the agent password that you copied from the live side into the "swmagent. box". C. Last, but not least for this page, in the lower half of the screen Right Click in the Is Enabled box and make sure the box changes to True. 4.Log into to the SWRemote Admin site and Press the Update button. Click HERE for more detailed instructions on Updating. If you need help with this, please contact SWRemote Support and they will trigger the Update for you. 5.Once the Update is complete, please move to the next instruction. 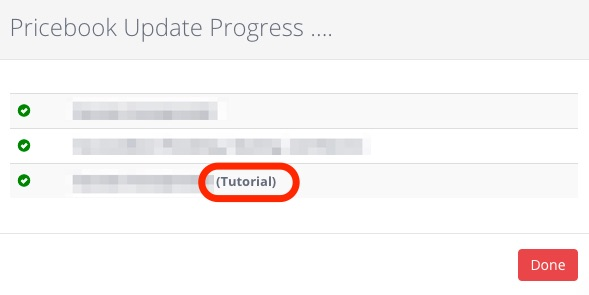 You will know that the Update is complete when the blue progress bar is finishied running, the Red Done button is pressable, and you will also see that your Tutorial company is visible in the list of companies now. 6. Please Quit SWRemote and relaunch it to be able to see the new company, by clicking on the Tutorialcheckbox. You may have to wait a few minutes to see the company appear on the Device/the tutorial company to appear in the Admin site, as well as the Pricebook to download onto the Devices. 7.Now you are ready to start using the Tutorial. You will need to create Jobs on the Tutorial side of SuccessWare21. When utilizing a generic database you will need to Setup Users from scratch, as you would normally do, but be sure to check the Tutorial check box when logging SuccessWare21. If you want the same Users from the live side to appear in the Tutorial side, you will need to recreate them from scratch on the Tutorial side. *Also, if you want the Techs to have the same password on the Live side and Tutorial side follow these instructions HERE. Alternatively, if you have questions regarding running the update via our admin site, please reach out to us!